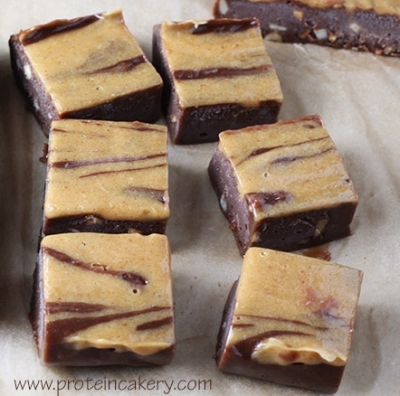 Chewy chocolate peanut butter deliciousness! High-protein, with no added sweeteners! 1. Line a loaf (or similarly sized) pan with parchment paper. 2. Mix chocolate whey and water (start with 3 ounces water). 3. Add peanut butter and salt. Mix well. 4. Add water if needed to get a consistency that can be spooned into the pan. Mix well. 5. Spoon fudge into pan. 6. In a small bowl, mix powdered peanut butter, vanilla whey, and water (start with 1 ounce water, add as needed). 7. Spoon or pipe the peanut butter topping in lines across the fudge. 8. Swirl by moving the back end of a knife perpendicular to the lines of peanut butter topping. 9. Freeze for several hours, until the fudge peels cleanly from the parchment and is firm throughout. 10. Cut into 18 squares (6x3 for a loaf pan). 11. Enjoy! Store in the freezer.